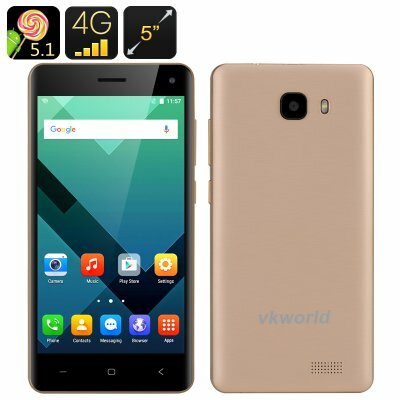 Successfully Added VKWorld T5-SE Smartphone - 5 Inch HD Screen, Android 5.1, 4G, Bluetooth 4.0, Smart Wake, LED Flashlight (Gold) to your Shopping Cart. The VKWorld is out with another smartphone model and, like always, it comes with lots to offer. The Android smartphone comes with a 5 inch HD screen boasting 1280x720 resolution, 4G connectivity, two SIM cards support and more. The new Android smartphone T5-SE from the popular Chinese manufacturer VKworld is a great and reasonably priced model. You will have a 5 inch screen with 1280x720 resolution and Android 5.1. This powerful combo will let you conveniently enjoy your media and has a great interface to manage it all. With 4G network support, you will have fast web speeds wherever you go and two SIM cards to manage your professional and private life. Bluetooth 4.0 support lets you easily hook up external devices like wireless headphones and speakers - with no annoying cables to mess with. Smart Wake is a also a great feature to have. It lets you get quick access from the locked screen to some of your favorite apps. A powerful LED flashlight is a good extra to have for blackouts or camping trips. The 2000mAh battery offers up to 3 hours of non-stop talking time and 120 hours on standby. Having great bang for your buck the VKworld T5-SE Smartphone comes with a 12 months warranty, brought to you by the leader in electronic devices as well as wholesale Android Phones..